Once the input form is sent via the Communication option, there is no method to cancel the communication or to modify any of the options selected. To remove a communication sent in error, emulate the faculty member and delete the message from the "To Do" section. The Start Term and End Term selected will determine where the data collected will be populated and stored in the database. Select these options carefully. It is possible to overwrite previously entered/collected data. If collecting data for a specific term/year, set the Start and End terms to the same term/year. Example: Collecting data beginning Fall 2015 and for every term forward. 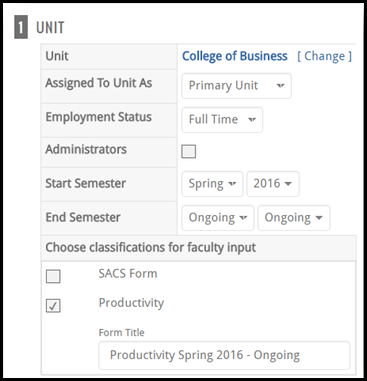 On the Admin menu, click Communication > Faculty Classification Form. The Faculty Classification Form screen displays. Employment Status: Filter the faculty selection based on employment status (i.e. Full Time, Part Time, Staff, etc.). Administrators: Filter the faculty selection to only administrators. Start Semester: Specify the Start semester. End Semester: Specify the End semester. Select the Faculty Classification form. 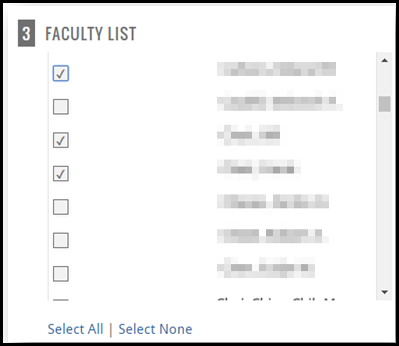 Only those faculty classification forms with the option to Allow input form to be sent to faculty via the Communication screen will be available for selection. (Refer to Create Input Form). Choose classifications for faculty input: Check the box to select the form to be sent to the faculty member. The Form Title can be changed. Enter a Message Expiration Date. The message will no longer display after this date. Also Send as Email: Select this checkbox to send the message as an email, in addition to appearing on the dashboard. Select the faculty to receive the communication.